Follow the convertible with the license plate TRIALSTAR, and if you can catch this whirlwind, you’ll discover the powerhouse behind the wheel is Debra Bogaards, partner in the law firm Bogaards Davis. When she isn’t schussing the slopes in Steamboat Springs, biking the hills of Pt. Reyes, or rowing under the Golden Gate Bridge, she’s busy being a Super Lawyer, a professional designation she has held for the past eleven years. But few know her secret passion – collecting dreidels. Like many who have accumulated stellar collections, Debra’s acquiring wasn’t planned. It started with a simple wish to treat her daughter’s kindergarten class to traditional Jewish dishes during the holiday season – latkes, homemade applesauce, etc. For fun, she decided to include a grouping of dreidels on the table, and the story grew from there. For those new to the custom – a dreidel is a four sided spinning top used for children’s games during the Jewish holiday of Hanukkah. Her collection runs the gamut from simple hand carved specimens to showcase pieces in crystal and sterling silver. Everything from the simple to the sublime is represented, including retailers like Tiffany, Christofle, Baccarat, Waterford, Limoges, Lenox and Nambe. There is even a 14 karat gold dreidel from Israel. A cursory count revealed over 150 dreidels. Once bit by the bug, collectors often transform into super sleuths. Bogaards even used an airport delay in Chicago as an opportunity to hop a cab and sprint back to the Spertus Institute to purchase a few gems for her growing collection. Now that’s dedication! Even when collections begin accidentally, I’ve discovered roots of acquisitions can run deep, often nurtured by childhood memories. Sure enough, Debra spent a summer picking pears on a kibbutz in Israel. Perhaps her love of tradition began there. She also recounted memories of sitting in a circle with her brothers spinning a blue and gold dreidel at holiday time. They would each put two hazelnuts in the “pot” in the center, rather than the standard pennies or chocolate favored by many, Bogaards continues the custom today, utilizing those same hazelnuts from 27 years ago. Each of the four sides of the spinning top contain a single letter. They represent the first letter of four words: nes (nun), gadol (gimel), hayah (hey), sham (shin). Nes Gadol Hayah Sham translates “A great miracle happened there.” The miracle? When the Maccabees rebelled under Syrian rule, they reclaimed their temple, and re-lit the sacred lamp. 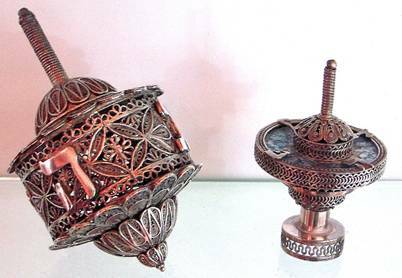 Although the lamp contained only a few drops of oil, enough to keep the flame burning for one day, the “ner tamid” or everlasting light, continued to burn for eight days, until new oil arrived. Indeed, a miracle. The dreidels in Bogaards’ collection that come directly from Israel have a different fourth letter – pey (po) which means “here”, and thus translate “A great miracle happened here.” According to Bogaard, these are the hardest to acquire. When asked how she chooses what to add to her collection, Bogaards happily replies “Acquire what you love.” Some of her favorites include those depicting the Wailing Wall. Note the two dreidels on the left which contain a stone wall supporting the Temple Mount. 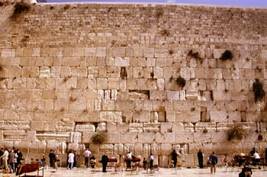 The stone structure is known as the Wailing Wall, from the custom of reading from the book of Lamentations and wailing of the destruction of the Temple. Legend has it that when the temple was destroyed by the Romans in 70 AD, the glory of God remained over these stones, thus this wall is the closest thing remaining to the original temple. 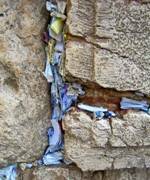 A site for pilgrimage and prayer for centuries, millions of visitors leave their written prayers tucked in between the stones of the wall. 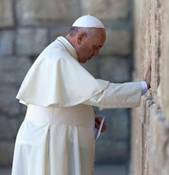 Pope Francis leaves a prayer request The Wailing Wall/Western Wall in Old Jerusalem. A cascading waterfall of hopeful prayers. “I have several dreidels by Limoges,” says Bogaards, “and it’s interesting to study each different pattern.” Note the gold coins depicted on the inside lids. Coins or chocolates were often used in the dreidel game. The example on the far right is a true antique. 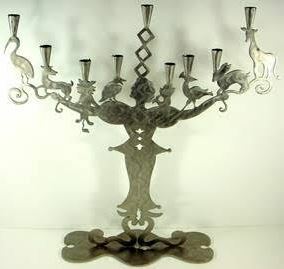 Other favorites include this antique pair executed in silver filigree. 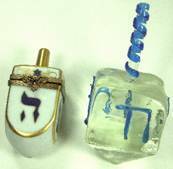 The opaline colored glass which coats the flat portion of the dreidel on the right is very early Roman glass from Israel. Bogarrds is also drawn to the minimalist and modern. Note the geometric dreidel in the middle of the bottom row. It dismantles to become a tiny menorah . Details in hand fused glass dreidels. A stunning wood & brass dreidel from India. 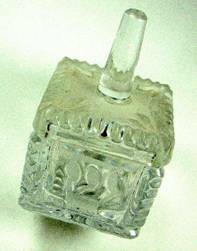 (Cost Plus) Ornate art nouveau glass dreidel from Godiva. 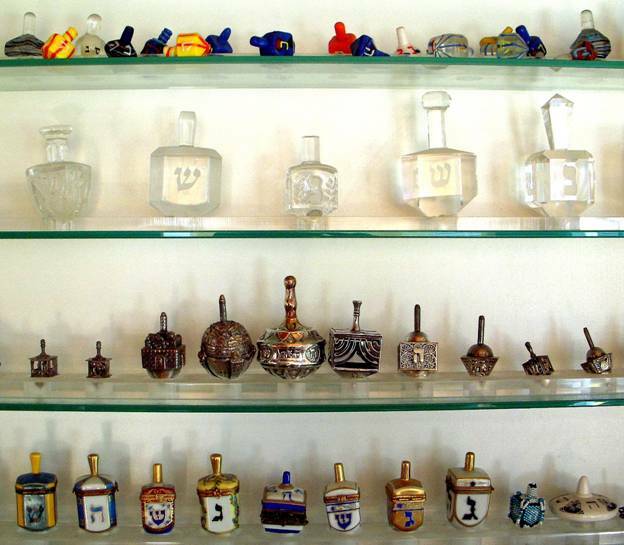 The glass dreidel on the right contains a mistake. The strokes that form the letter “hey” shouldn’t touch. The correct rendition can be found on the left. Historical accounts vary widely on the origin of the dreidel. Some say the word is a Yiddish appropriation of the German “drehel” or “to spin”, and that the game was based on a popular German gambling game of the late Middle Ages, first introduced during the Roman Empire. The spinning top was inscribed with words that translated “nothing,” “half,” “everything,” and “put in.” When Bogaards was in Belgium, she found a tiny (no bigger than a thumbnail) brass dreidel in an antique shop, along with miniscule dice. The proprietor explained it was not a dreidel, but a gambling game. According to Rabbi David Golinkin,* the elaborate explanations of the dreidel were invented after the fact, and indeed, this teetotum originated as a gambling toy. The ever resourceful rabbis transformed the dreidel into a teaching tool, while pretending they were gambling whenever their captors came into view. They translated the symbols to represent teachings of the Torah, preserving and passing on their traditions to their children, while confined in captivity. Mighty clever! Bogaards claims collecting is never done, as friends, family and even law partners have become excited about adding to her collection. She claims an interviewee for a paralegal position for her firm brought her back a “lovely green Venetian glass dreidel from the oldest ghetto in Italy.” Not surprisingly, she got the job! The dreidel is no bigger than a quarter, it’s delicate, swirling colors as mesmerizing as a butterfly’s wing. What may have begun as a gambling game was transformed by resourceful Jewish elders into a tool for teaching history, tradition, and faith. It is recognized today as a symbol of heritage and ritual for both current and future generations. Good Morning America published a story on the Dreidel Renaissance in 2009, and indeed, collecting is most assuredly on the rise. 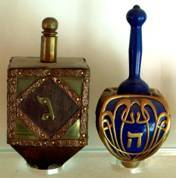 You can view dreidel collections at the Spertus Institute for Jewish Learning and Leadership in Chicago, Yeshiva University and Temple Emanu-El, in New York, among other places. This blog features the collection of a single individual and in no way attempts to cover the history of the dreidel which is rich and fascinating. *Rabbi David Golinkin, Ph.D., is president and rector of the Schechter Institute of Jewish Studies in Jerusalem, where he teaches Talmud and Jewish law, and he heads the Va’ad Halakhah (committee on Jewish law) of the Masorti, or Conservative, movement’s Rabbinical Assembly in Israel. o my, o my, a beautiful presentation..thank you. As always your unusual finds are interesting, beautifully presented and oh so educational! I learned a great deal myself, which is always part of the adventure when viewing people’s collections. Brilliant writing as usual, and such gorgeous dreidels!! Thanks for always making me a little more educated. Looking for help….I found a brass dreidel at an estate sale and am trying to find out more information about it. I have looked online to no avail. Mine is brass with a saw-tooth bottom. The letters are additional pieces of metal adhered to it. Any thoughts? I’m not a dreidel expert, but I’m passing your request along to Deborah, the collector and shall ask her to contact you if she can help at all. Best of luck with your search. That is a sterling silver dreidel from Israel in my collection, made by an artist. I don’t have any thoughts regarding your discovery…sounds interesting, though.So, a dreidel has 4 Hebrew letters on it. The one that changes, depending upon whether it is an American dreidel or Israeli dreidel, is the “shin” and “po” respectively. The “shin” means “there” (ie,in America, looking to Israel) and the “po” means “here” (ie, in Israel). Which one does your dreidel have? That will at least help you with country of origin. Wish I could see a photo! Enjoy your estate find. What an amazing discovery! Did you take it to an antique dealer?